Arinsal/La Massana come under the ski area of Vallnord, which includes Pal and Arinsal. The resort of Arinsal has a good choice of accommodation ranging from luxury spa hotels to very affordable apartments, there is something to suit all budgets. The resorts of Soldeu & El Tarter form part of the Grandvalira ski area with 210km of piste, which also includes Pas de la Casa. The two resorts sit side by side and have a very impressive selection of good quality accommodation at affordable prices and a lot of the hotels offer after ski relaxation in their wellness centres. The ski areas suit all levels with impressive facilities for the kids, beginners and advanced levels. Pas de la Casa comes under the ski area of Grandvalira which consists of 210km of piste that also links this resort to Soldeu and El Tarter. There are a wide range of hotels and apartments to choose from to suit all budgets. 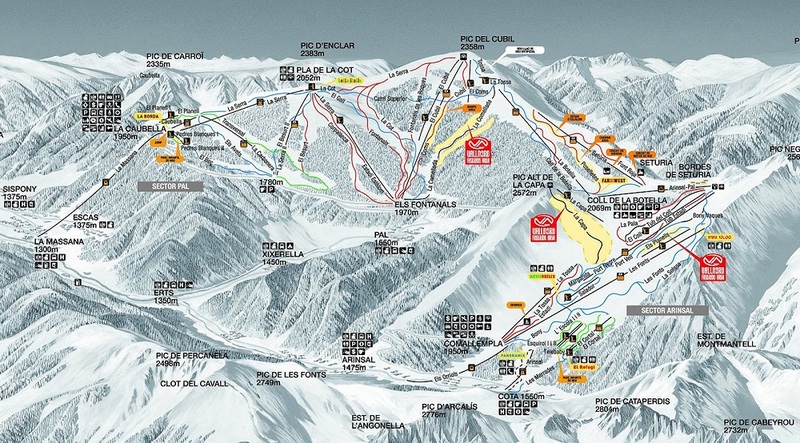 Encamp is part of the Granvalira ski area of 210km of piste ranging from beginner to advanced levels. The six valleys within this area are Soldeu, El Tarter, Pas de la Casa, Grau Roig, Canillo and Encamp. Canillo is part of the Granvalira ski area of 210km of piste ranging from beginner to advanced levels. The six valleys within this area are Soldeu, El Tarter, Pas de la Casa, Grau Roig, Encamp and Canillo. El Cabin – A very popular apres ski bar and great for a laugh watching videos of you and your friends at ski school that day. El Moli – A very popular apres ski bar to let your hair down and have a few drinks & cocktails. Underground – Listen to resident DJS from Ibiza or relax and listen to a bit of live lounge. The Iqos Bar – A great bar for relaxing and enjoying a cocktail or two. Red Lion – Great for drinks and live sports. CBbC – Bringing Ibiza to Andorra from its music to it’s food and drink. Fat Albert’s – A popular apres ski bar for drinking and good music. Bar Code – Relaxing apres ski bar with acoustic live music and mountain views. Aspen – Sports Bar showing daily live sports with live music once a week. El Cabin – Serves traditional British pub food such as a full English breakfast & pizza, pasta and nachos. This is also a very popular apres ski bar and great for a laugh watching videos of you and your friends at ski school that day. Cisco’s – This Mexican restaurant is not only known for it’s fajitas but it’s menu also has ribs, burgers and their famous mango chicken. El Moli – This is the place if you fancy a Sunday roast but also serves food every night such as pies, stews and Thai curries. A very popular apres ski bar to let your hair down and have a few drinks & cocktails. Sushi & Gong – A fairly new Japanese restaurant serving sushi and Japanese cuisine. Deja Vu – Great for steaks, burgers & pizza with a relaxing atmosphere. Underground Bar & Grill – Choice of burgers, ribs, steaks & chicken. This lively restaurant & bar also shows all your sports on TV. KSB Altitude – A fantastic steak restaurant set on the slopes, especially good for those with a big appetite. La Familia – A family run restaurant offering seafood and selection of grilled meats. El Marselles – Take in the stunning views whilst enjoying tapas, pizza and steak or the famous raclette and fondue. Melting Pot – Amazing menu offering a selection of dishes from both Europe and Asia. Red Lion – Great for snacks and live sports. CBbC – Bringing Ibiza to Andorra from its music to its food and drink. Fat Albert’s – If you like ribs this is the place for you, plus the menu has many more popular dishes and local specialities. Later on it becomes a popular apres ski bar for drinking and good music. Sol I Neu – Based in the Sport Hotel Hermitage, this traditional restaurant serves impressive local food to match the surroundings with its picturesque views. Borda de I’Horto – From fish to fondue or a great selection of grilled meats, enjoy a good meal in this farmhouse style restaurant. For the best shopping pay a visit to Andorra la Vella, the capital city. Here you will find a huge array of shops selling mainly electrical goods, jewellery, perfume, alcohol, cigarettes and tobacco, all at duty free prices. Pas de la Casa is a shoppers paradise, due to its location on the French-Andorran border. Pas de la Casa is the first port of call for many bargain hunters looking to take advantage of Andorra’s low tax and duty free prices and because of this you will find a multitude of shops and supermarkets offering an array of goods, particularly alcohol and cigarettes at low prices. There are many perfumeries, jewellery shops and some great clothes stores offering well known brands such as Diesel, Mango, Roxy, Quicksilver and O’Neill to name just a few.